Mind the Milestones Expectation Gap! Ever feel that you’re not only living your family’s life but the lives of hundreds of others too? The proliferation of social media and reality TV shows means that we now don’t only mark our own children’s milestones we celebrate thousands more! The end result? The more these traditional milestone moments are shared and re-shared, the more parents are finding that the reality doesn’t always live up to expectation. So you’ve had a baby – Congratulations! You’ve brought your little bundle of joy home with you and you’re trying to settle into life with a tiny human. You’re a bit tired but get lots of lovely snuggly cuddles which makes it all worth it. You’re snapping photos to send to friends and family and someone says ‘don’t forget to take a photo of their first bath’. Sure, bathing a tiny little baby can’t be that hard can it? Think again! Your lovely peaceful baby will turn into a wailing bundle of anger to moment you undo the first popper on their sleep-suit. They’ll turn red with all the shouting, and a holding a naked wet baby is akin to picking up a bar of soap from a sink full of water… it’s not easy! 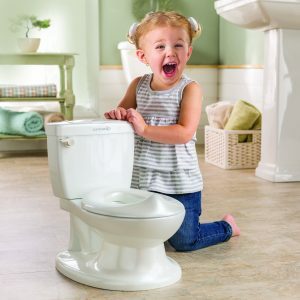 The thought of potty training tends to fill most parents with dread, however potty training doesn’t have to be a chore, in fact it should be celebrated. Spending those final moments with your little one as you bathe them and soothe them before bed is a really precious time.